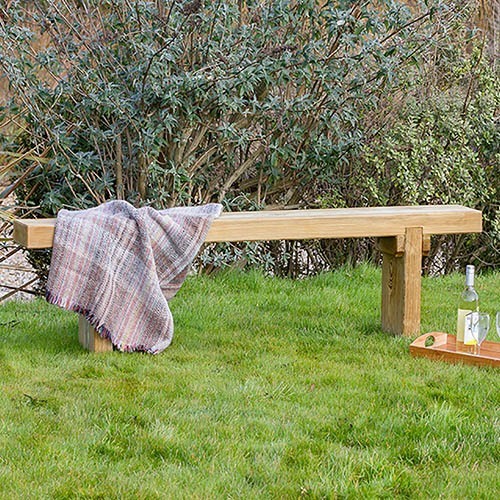 A simple garden bench that will fit in perfectly with any style of garden, The Rebecca Bench makes for comfortable seating, with relaxation in mind. Sturdy in design, this seat has been produced from a solid, chunky piece of timber and will enhance any garden or patio space, while standing out throughout the year - pair together with the Rebecca Table to create an enhanced dining experience. Easy to put together, you'll receive all fixings and full instructions, so you can assemble it quickly and simply and get relaxing in no time at all! Great value, the Rebecca Bench is manufactured from high quality, pressure treated, FSC® Certified timber to last longer, and comes with 10-year guarantee against rot. It's strong, durable and can be used year after year. Dimensions: 1.80m x 0.24m x 0.43m, assembly required - This product is 1-person assembly.